We’ve all had those days when cabin fever sets in and we just need to get out of the house for a little while. And just as the door is almost closed, you see your dog’s melancholy face in the crack of the doorway practically begging to come along. But, taking Fido along with you as you grab a quick bite or a cup of coffee doesn’t seem practical. Well, it turns out some local businesses are making sure you no longer need to feel guilty about those puppy-dog eyes as they will gladly accommodate both of you. In recent years, hidden menu items have become sort of a well-known secret at several establishments—grilled cheese at Shake Shack or Wawa’s recent secret milkshake offerings—but what you may not know is that your pets can get in on the fun as well. 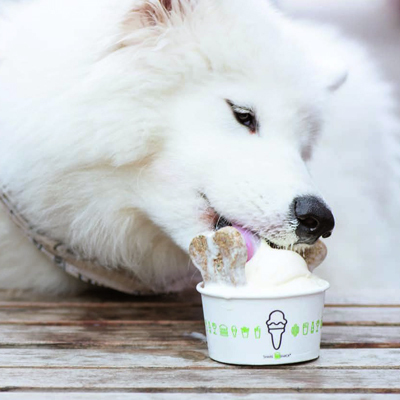 From ice cream to cupcakes, there’s an array of pet-safe treats being served up, you just have to know where to find them. Well, we’re here to help, however, be sure to consult with your veterinarian before you treat your furry friend and check with a specific location as not all offer pet-friendly options. You can search the menu up and down, but unfortunately you will never find this next to the espresso beverages. The Puppuccino isn’t an official menu item, but the baristas won’t stop you from ordering the dog-desired treat. What’s usually requested from everyday customers as extra whipped cream, the Puppuccino is exactly that, in a cup. Although pets are not allowed inside the coffeehouse, Starbucks allows pets on property outside on the patios and will provide water bowls if needed. Priding themselves on customer service, Chick-Fil-A doesn’t forget its four-legged customers. If you pull up to the drive thru with your pup’s head out the car window—as they usually do—Chick-Fil-A takes your furry friend into consideration by handing them a treat. However, some locations require an inside visit to fetch the treat. The burger joint that evolved from a hot dog cart to a nation-wide phenomenon now has pets joining in on the cult-like following. Its signature offering is a cup with a big scoop of vanilla ice cream with drizzled peanut butter and two dog biscuits. The biscuits come courtesy of Bocce’s Bakery, an all-natural dog biscuit company out of New York City. This treat is not intended for smaller dogs, but don’t fret, you can still take home a bag of biscuits. Pets aren’t allowed inside the premises but are welcome on the outdoor patios. We all love perusing cakes, cookies and other delectable treats in the cases at our favorite bakery, but now pets are having a sweet time as well. Area bakeries like Voorhees’ Cake Stand Bakery, Glendora’s Bakery 519 and Mount Laurel’s Sunflour Bake Shop each offer something unique for pets. Think chicken liver and bacon dog treats or banana-flavored pupcakes with peanut butter icing—even full-sized cakes for your next milestone celebration. And it’s not just eateries and coffee shops offering you the chance to spend some quality time with your pets, several retail stores are also opening their doors to dogs so you can have your very own personal shopper. Old Navy, Home Depot, Lowe’s, Pottery Barn, Barnes & Noble, Anthropologie and Foot Locker are just some of the stores, but you’ll want to check with individual shops before gearing up for a shopping spree, as individual locations vary the policy.